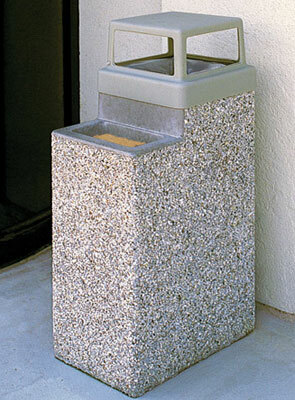 These classic concrete ash/trash waste containers ash urn & garbage can combination waste containers help reduce trash, litter, and properly dispose of cigarettes and cigars. The unique design of these concrete waste containers along with the solid steel-reinforced construction will enhance the entranceways of your facility and easily withstand the toughest environments anywhere in the world. These ash trash combination waste receptacles feature a compact style with a highly effective litter control system for trash, the proper disposal of cigarette butts, cigars and related litter and debris. The compact style is perfect for any area that is expecting moderate to light trash disposal with a need for cigarette disposal as well.